The inaugural Bridgestone World Series Hockey witnessed yet another sizzler as Pune Strykers got past Karnataka Lions by a slender margin of 3-2, in Pune, on Monday. With three wins and draws against one defeat in the previous match, Pune became the first team to notch up 12 points to top the table on the penultimate day of Round One of the WSH. With the score tied at 2-2, Damandeep Singh struck heroically out of a quick follow-up to a failed penalty corner sequence in the 55th minute, to end the deadlock even as Karnataka messed up three of the six penalty corners they earned in the last four minutes of play. Pune Strykers' Roshan Minz availed a pathetic defensive lapse from the Lions to take the lead. In the second quarter Len Aiyappa to brought the score on parity. After a lull for some time, the match came alive with two terrific goals coming in two minutes in the third quarter. It was Inocent Kullu for the visitors while Strykers' Damandeep sealed the match with his opportunistic strike. This was one of the most convincing display from the Badshahs in the entire tournament. Skipper Samir Daad led from the front, goalkeeper Baljit Singh celebrated his birthday with a solid performance against the best drag-flicker in the tournament, Pakistani star Imran Warsi, their defence was tight, the midfield moved in tandem and the forward-line showed a never-day-die attitude. Daad struck early in the match in the 20th minute but Cheetahs' Vikram Pillay found the equalizer two minutes later from a penalty stroke. Joseph Rearson tore apart the solid looking Bhopal defence and earned a controversial stroke which survived a referral. 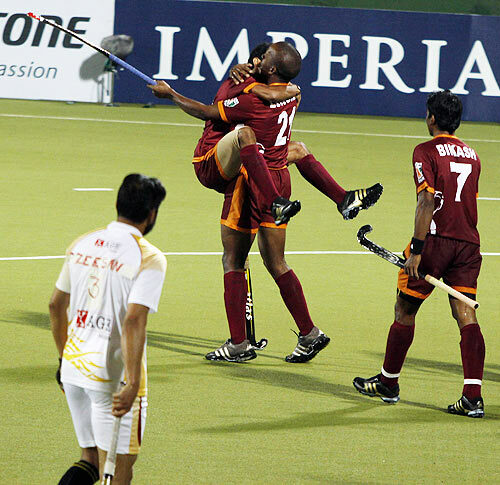 Pillay placed the stroke to the top right corner of the net to restore parity for the moment. The Badshahs struck again through a move by Pakistani star Waseem Ahmed, and Lalit Upadhya enhanced the lead in the 48th minute. Within five minutes, the lead was consolidated further by Casey Henwood, who made full use of a Daad's feed to complete the tally in the 52nd minute. The Cheetahs paid the penalty for missing their chances in the first half and failing to stop a rampaging Daad, who led the Badshahs brilliantly. The green machine played like a team possessed and a jam-packed Aisgbagh Stadium in applause--made a great viewing for hockey. It wasn't that the Cheetahs played badly; actually the Badshahs were playing as if in a trance.